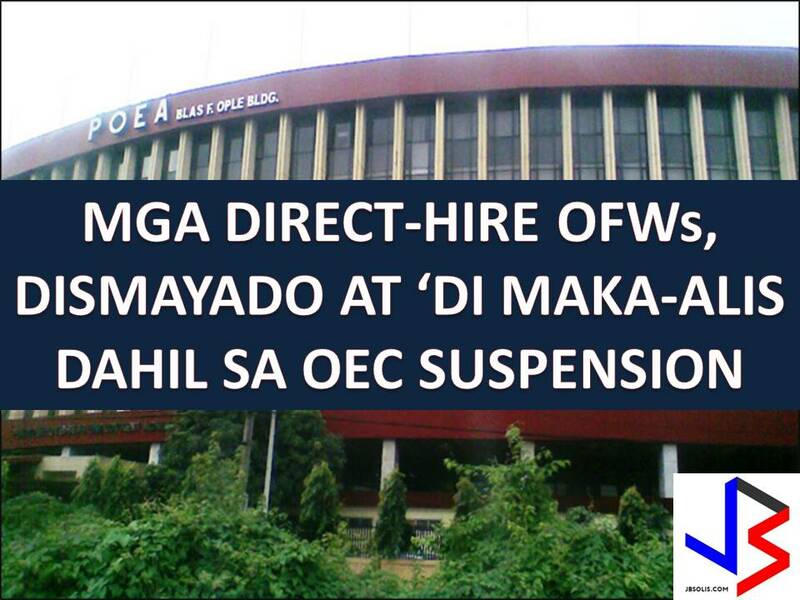 THOUGHTSKOTO Thoughtskoto : After OEC Suspension, What Will Happen Now to Direct-Hire OFWs? After OEC Suspension, What Will Happen Now to Direct-Hire OFWs? The suspension is base on Administrative Order No. 155 issued by Labor and Employment Secretary Silvestre Bello III to stop the processing of new direct hires after receiving reports that they become targets of some unscrupulous personnel of the Philippine Overseas Employment Administration (POEA). “We are strictly implementing the ban on direct hires. No exemptions shall be issued effective April 25 after we have gathered information on the anomalies and illegal extortion activities within the agency (POEA),” Bello said. As a result of the suspension of OEC processing and issuance, direct-hired OFWs cannot leave the country. Also, vacationing direct-hired OFWs cannot go back to work abroad until the suspension is implemented. The suspension is based on the initial findings regarding some suspected fixers within POEA who have been extorting around P15,000 to P17,000 from each applicant. Labor chief said an investigation has been ordered because corruption has to stop. Reshuffling within the ranks of POEA will be implemented. In line with these OFWs affected by suspension are advised to contact their respective Philippine Overseas Labor Office (POLO) to make sure they will not encounter problems regarding acquiring OEC while having a vacation in the Philippines. OEC serves as a travel clearance for OFWs from POEA. POLO offices issue OEC too for Filipino workers who seeks annual leave or emergency leave so that they can come back to work abroad after the vacation. Bello admitted that the sudden increase in the number of direct hires seeking mandatory clearance from DOLE has caused delays in the deployment of directly hired OFWs. But he assures that the POEA have adopted measures to address the delay in deployment of direct hires or those workers who found an overseas job without the assistance of recruitment agencies. Bello added that the government allows the direct hiring of workers only if they are secured and would be treated rightfully by their employers.